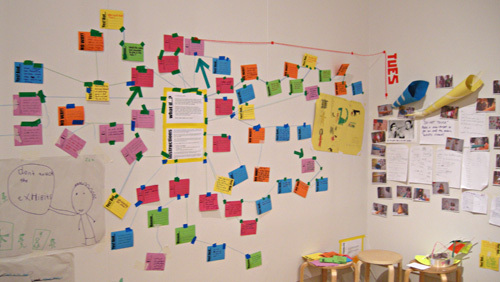 Two girls came in from the rain and spent a long time adding ideas to the hugemongous mind map. I challenged them to build as long a chain as possible, taking it in turns to bat responses to eachother’s ideas. I didn’t get to look at it until after they had gone, but nice work ladies! We’ll be taking some of your ideas as the starting point for tomorrow’s investigations. Signposts, and the knowledge passed on between kids. 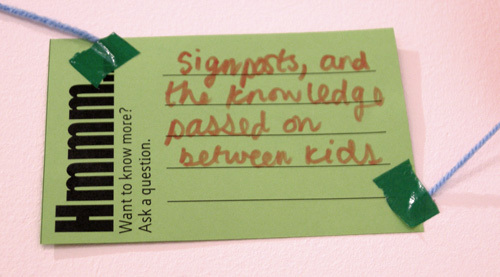 Starting from a concern that if the museum assistants went on strike there would be no guided tours, they got on to thinking about signposting and knowledge being passed between the kids who could direct their own learning independently. Ace! Tomorrow we will be investigating alternative tours around the museum, designed by little people for little people. Inspectors will be deciding on their own trails through the building, with maps and clues for those in the know. This is going to be an interesting test to find out how much attention the big people pay to the things happening closer to the ground. Come and join us for The Lowdown!